I love sweaters. Like, REALLY LOVE sweaters. 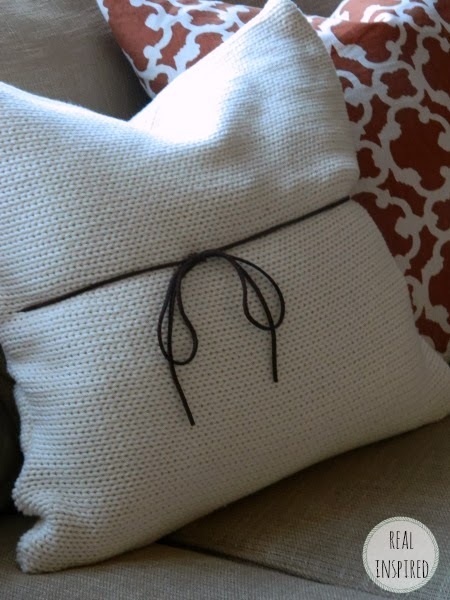 I also love pillows. What better way is there to decorate for the colder seasons than combining the two? And since I happened to have this particular sweater on hand, it was perfect. I had an old sweater than was really long and a size too big. It was wonderful, but I didn't really wear it anymore. But I hated to part with it. And so I decided to make it a pillow. My pillow insert was 18". And it fit perfectly in between the side seams. This sweater is such a thick, loose, chunky knit that I wanted to minimize the amount of sewing I had to do. Cutting it this way meant that I only had to zig-zag the cut edge to keep it from unraveling, line up the side seams with the side seams on the pillow, fold the edges over and sew them closed, creating an envelope type cover. Since the insert was 18", I added an inch across for the seams, making it 19" across. Even with my attempts to sew as little as possible, I still had a few issues. Running a zig-zag stitch across a sweater with this knit is asking for trouble. The loose ends will get pulled down into the machine as it pulls it along. I expected this to happen and, sure enough, it did. I had to stop several times and cut the threads where it had jammed down into the machine and start over a little further back. 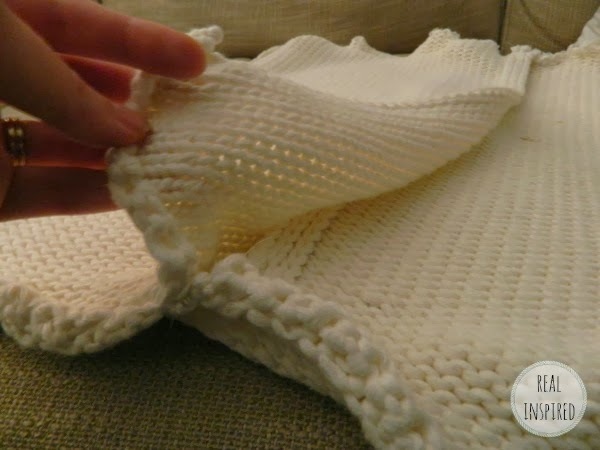 Once the side was zig-zagged, I folded each side over at the sweater's side seams. There is quite a bit of overlap. Which I didn't worry about because, hello, less sewing! Than I sewed a straight stitch up each open side. Instead of sewing each side once, I sewed one flap down on each side and then sewed the other flap up MOST OF THE WAY. Since this is an envelope cover, I was really afraid that if I sewed both flaps down over each other, that it would put too much strain on the knit when I was stuffing it. Here's a shot of it inside out where you can see that one flap is completely closed while the other is sewn almost up to the other flap but then left free. Here's a view of the flaps with the cover right side out. The un-sewn flap is tucked up under the outer flap and no one knows that is isn't sewn all the way. It stays inside just fine. 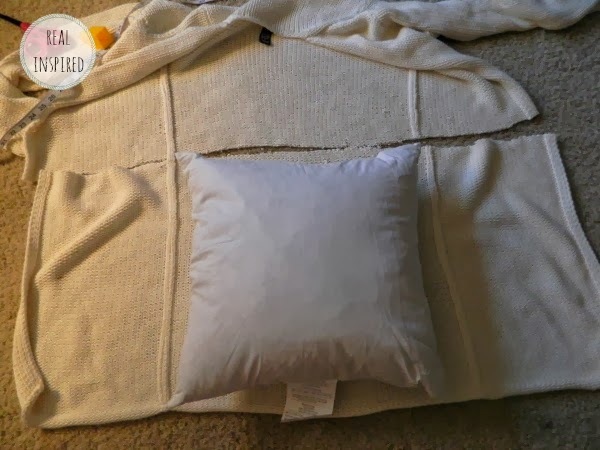 This was a thick sweater so sewing the seams took some patience and maneuvering. I think I sewed all the seams shut with the presser foot up all the way because it was so thick. 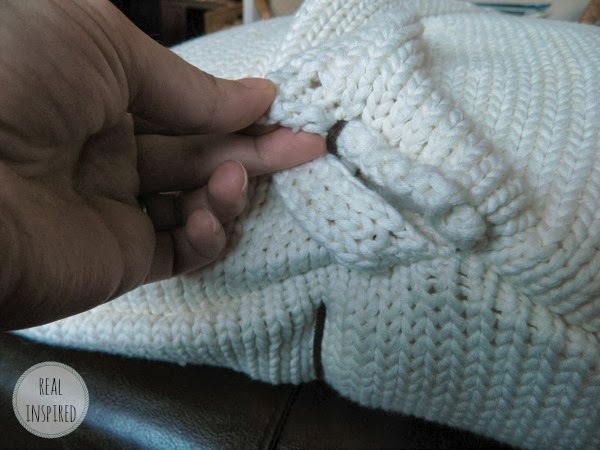 Especially sewing over the sweater seams. It was like going up a hill and the presser foot only goes up so high. Sometimes it takes some coaxing to get it through. Then I turned it right side out and stuffed it. I added the leather cord for some interest. It was the little "belt" that came with the sweater so I already had that too. Just wrapped it around and ran it through the sides to help hold it in place. It isn't perfect. It's kinda floppy. The corners look a bit different. But it has character. Beauty does not equal perfection. Sometimes beauty is all in the imperfections. I'm still learning this. 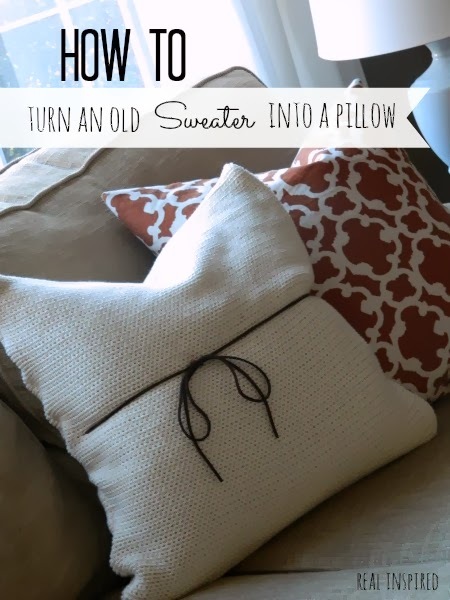 The great thing with sweater pillows, is that they span a couple seasons. Fall, winter, and maybe early spring if you happen to live where it still snows in April. Down here in Virginia, fall and winter are probably all it will make it through. Maybe. I just like sweaters way too much.